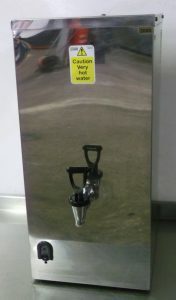 Compact and reliable Single Tap water boiler for most commercial applications. Ideal for the busier cafe, deli or bistro. In high grade stainless Steel and Brass construction. 25 minute heat from cold with long life elements. With drip tray. Hard wired 13 amp power and cold water feed required.